← When Saroj Asks You To Do Something, You Do It. This image should make you sad. Babies need laps, not apps! We’re loud and proud here at LittleeLit and we’ve made it very clear that this technology is something that should be embraced by librarians and other professionals alike. However, I’d like to address an issue that has come up time and again for us. A lot of people who don’t agree with our viewpoints will HEAR what we’re saying but won’t actually LISTEN. They hear us say that tablets should be something that’s embraced by families and assume that we’re agreeing with parents who use technology as a crutch and a babysitter. This is not the case. 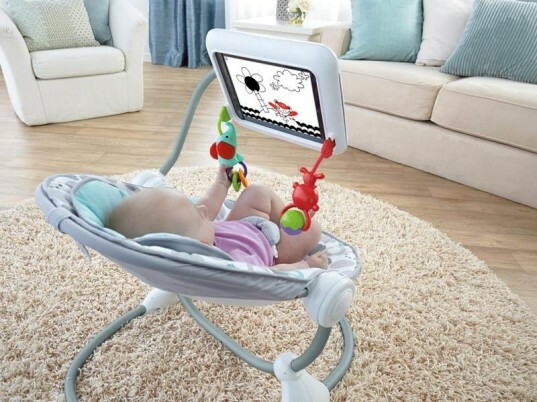 When I saw the article about the CCFC lobbying to get the iPad bouncy seat recalled I found myself nodding my head in agreement. I passed it along to other LittleeLit-ers to find out their opinion and they agreed. Phrases such as, “Not developmentally appropriate”, “These kinds of baby chairs are really ill-conceived and unfortunate”, “downfall of civilization”, and “zombie apocalypse” were brought up. While we don’t always agree with what the Campaign for a Commercial-Free Childhood does or says, there are moments where we find ourselves fighting the good fight right along with them. As early literacy professionals it is our duty to provide quality information to our patrons by arming them with the best knowledge on how to successfully navigate this new world while having the healthiest media consumption possible. And yes, that also means being against sticking an infant in a bouncy chair with an iPad in his face and calling it a day. We agree with you on this one, CCFC! Posted on December 11, 2013, in Literacy. Bookmark the permalink. Leave a comment.